At the 1-year Maker Education Initiative (MakerEd) anniversary celebration at the Maker Faire on Thursday, Dale Dougherty presented his vision for bringing making back into schools by connecting it to science and technology education through Maker Corps Summer programs and Makerspaces in schools. In these spaces, Dougherty hopes, children will have access to tools and people and will be able to work on make projects. Essentially, the spaces could provide children with the empowering opportunity to think of themselves as makers, creators and doers and to deploy those skills back into their communities. In the spaces, teachers could create their personal and individual educational material to be used in their teaching, see examples, connect to others and take their learning back to the classroom. Through the DARPA Mentor Award, 50 Makerspaces have already been established in Bay Area schools, Dougherty mentioned. In the near future, the richness of the Bay Area Maker Movement is planned to be brought also to other areas in the United States. Also teachers in Europe show a strong interest in the inclusion of Maker projects in school learning. This became especially clear through pre-pilots of a learning story called “create an object“, in which teachers were asked to facilitate design-based learning activities. Besides the establishment of Makerspaces in schools, another path of reaching kids through teachers may be to train teachers in Hacker- and Makerspaces, and to share learning online. However, currently those spaces mainly cater to adult makers. During our study teachers raised concerns about the potential dangers, lack of supervision, and strong language use in those spaces. 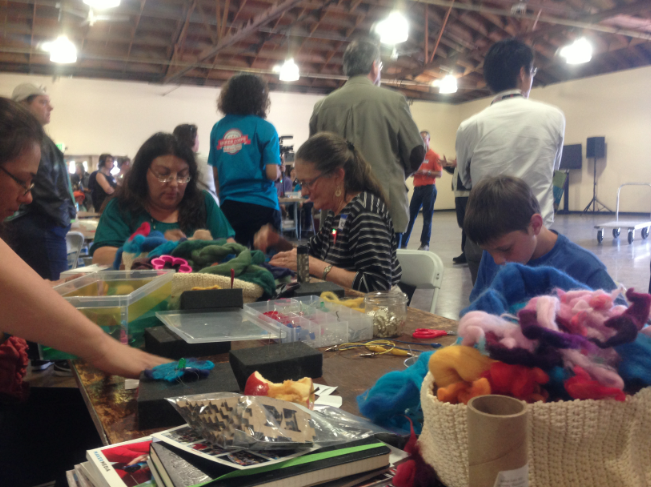 Teachers at the MakerEd anniversary raised similar concerns when discussing ways in which MakerEd can be integrated to existing Hacker- and Makerspaces. Sophia Bender demonstrates the connection between learning and creating with e-textiles. Although MakerEd recognizes the strong links between design and making, so far no curriculum, a sequence to follow, has been created in support of learning design at school. The focus lays on children creating projects and choosing their paths on how they want to go about it. Through the design-based learning activities, we aimed at linking making to design and learning design at school in much a similar way by focussing rather on the role of the teachers as guide, listener and provider of inspiration. 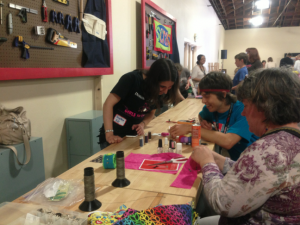 MakerEd is planning to focus on spaces in the near future. In support of that, Google for Entrepreneurs and Cognizant have recently joined the Maker Education Initiative. Google’s role in the initiative is to connect people through google hangouts, weekly online development camps that can engage kids without Makerspace in their community in the maker movement. Cognizant is collaborating with six educational institutions, including the Exploratorium, the Children’s Museum of Pittsburgh and the Chicago Children’s Museum, to establish making as a way to close the achievement and opportunity gap through, for example, after school summer programs. These programs are focusses on sparking interest, not efficiency in STEM learning and present the Maker movement as an educational vehicle that is accessible to anyone and that can to cater to kids of any background. 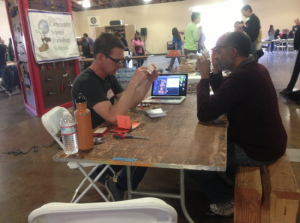 FabLab San Diego develops and implements educational Maker programs. Scrap-sf.org offers courses in creative re-use of everyday objects. 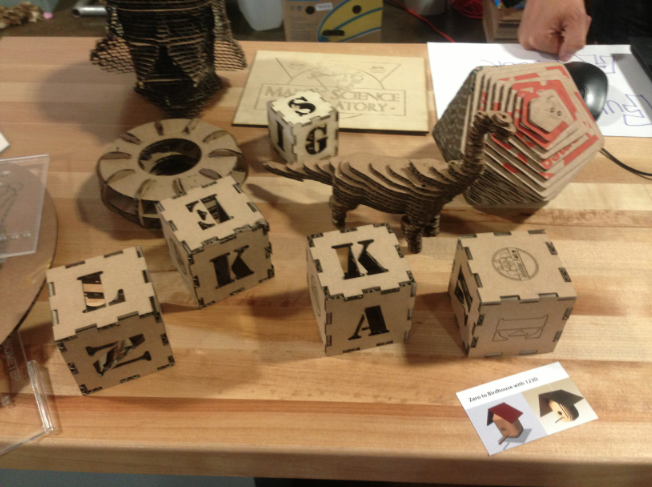 The Exploratory offers an online introductory course on Making for Educator. Thank you, Christian McKay for sneaking me into the event.